Review date: 9 February 2001. Do you regularly collapse, exhausted, from the sheer effort of shoving your mouse around against terrible, terrible mousemat friction? OK, neither do I. 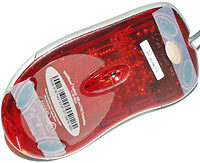 But making your mouse slide around more easily makes it easier to use it accurately. Once you get used to a low-friction mouse, you're likely to find that the lower effort required makes a small but significant difference to fine positioning. This is nice for people doing graphics work with a mouse, and it's nicer for people playing action games. You can't be a Quake God if your mouse can't be counted on to work consistently. So slicker mousing surfaces are nice. Most of the world's mouses are pushed around on the usual nasty squares of wetsuit fabric, but switching to a lower friction surface like the hard plastic mats from Everglide or Ratpadz, or the how-complex-can-we-make-a-mousemat fUnc Industries sUrface1030, makes a big difference. If you're of the opinion that you can't have too much of a good thing - or too little of a bad one - then allow me to introduce you to a new toy, available from Everglide, arguably the instigators of the whole modern trend for mouses-that-slide-when-you-breathe-on-them. There are two things that determine how slick a given mouse's motion will be - the mousemat, and the feet on the bottom of the mouse. Mouse Skatez let you upgrade the feet. Skatez originally sold for $US6.95 plus shipping - and they can be shipped in an ordinary envelope; now, in early 2003, they're only $US3 plus shipping. This makes the $AU18 plus shipping that Everglide Australia's selling them for look just a tad steep, but the things still aren't going to break the bank. You get enough for your money to do two mouses - or to screw up once and try again. Mouse Skatez are made of, to quote the dealers' highly technical explanation, "super slippery stuff". They are, essentially, very slick Teflon-ish sticky tape. 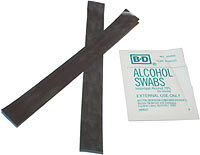 So to apply them to a mouse, you just clean off the feet of the mouse with the supplied isopropyl alcohol wipe, then cut the Skatez strip to an appropriate length to cover the whole foot area, peel off the backing, and stick 'em on. You don't peel off the existing feet - the Skatez strips just stick on over the top. 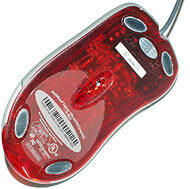 I gave the Skatez a go on my Microsoft IntelliMouse Explorer, which is an unusually large mouse. The Explorer's feet are further apart than most, and there wasn't quite enough tape on one Skatez strip to cover both ends. It might just barely have made it, but I wanted a bit more overhang, and so I snipped down both strips - which still left enough to do a smaller mouse. With the blue backing removed, the Skatez tape is very thin, and translucent. It conforms well to the contours of the feet, and sticks firmly. I don't know how well it'd do with an older-style mouse that has the suede-type fuzzy feet; every recent mouse I've seen has slick plastic feet, though, and on those the tape sticks well. The Explorer's feet aren't very high friction at the best of times, and the fUnc mousemat I've been using for a while now is pretty slick, too. The Skatez tape made an obvious difference, though; there's now practically no "stick" between the mouse and the mat. I quite like the effect. This doesn't mean you will. If you switch from a relatively high friction mouse setup - if you're using a 3M Precise Mousing Surface, for instance, which was the first of the "designer mousemats" and is considerably stickier than the hard mats most of us dedicated virtual snipers are using these days - then switching to a plastic mat and Mouse Skatez may be too big a change. Really ultra-slick mouse movement can be annoying. The nice thing about the Skatez, though, is that they let you go in stages. Get your funky mousemat, get used to it, then stick the Skatez on. If you don't like 'em, peel 'em off again. You're only out a few bucks; no big deal. There are other low-cost ways to get that super-slippy mousing experience. Giving your already-slippery hard plastic mousemat a rub-down with Armor All does the trick, for instance; sure, you end up with a thin film of silicone slime on your wrist, but it's harmless. This strategy's cheap, but it's not so great if you've got an opto-mechanical mouse, with a ball. Silicone gets on the ball, and you lose friction between it and the pickup rollers. Before you know it, your pinpoint 180 degree spin becomes a sloppy 192 degree one, and you're zapping railgun slugs into the wall decorations as your opponent inflicts a Humiliation upon you. Using WD-40, as some gamers do, can be even worse - WD-40 is mainly kerosene, and it'll attack various other substances - like mouse foot glue, and silicone rubber, which is what the balls in those charmingly quaint opto-mechanical mouses are coated with. The Mouse Skatez are more elegant than these, um, "ghetto tweaks". Putting them on takes minutes, taking them off if they don't turn your crank takes seconds. And I rather like them. Given the price, any hot-shot gamer should consider this stuff. No doubt you can buy it by the mile from whoever actually manufactures the tape, and paying $US3 plus shipping for a couple of 4.5 inch lengths of the stuff represents a hefty markup - this leaves room for other people to undercut the price - look here, for instance, for a cheaper version of the same thing. But it's not as if it costs a fortune, either way. Cheap, and good. Recommended. Review Mouse Skatez kindly provided by, oddly enough, Mouse Skatez. That site seems to have dropped off the Web, though; now you can find Mouse Skatez at Everglide. Also available from Everglide Australia. What it costs: $US6.95 plus shipping originally; now $US3 plus shipping from Everglide. $AU18 plus shipping in Australia. Best points: Works nicely. Easy to apply. Worst points: Are you ready for a mouse that's slicker than frozen Teflon-coated alien mucus?